Since the age of 11, Aaron Rabe has been creating and crafting costumes and movie props. Over time, he has made creation his career, now being a full-time cosplayer and professional prop builder. 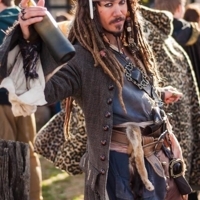 He has won a series of awards for his world famous Jack Sparrow, including multiple Best in Show, best performer, and best returning performer at Renaissance Fairs and many large conventions including Wizard World. Aaron’s movie props have been featured in multiple independent films and worn by multiple celebrities. His props have earned over 35 awards for their screen accuracy and craftsmanship. Aside from his costumes, he also has a love for theatre and music, having acted in over 40 plays and performed in different bands over the last 15 years. Aaron has also taken his experience on the stage and moved it behind the scenes: making sets, producing and directing. Performing and making people smile everywhere is his favorite pastime, because it’s about the journey not the destination.